I'm at the Mozilla all-hands week in Whistler. Today (Monday) was a travel day, but many of us arrived yesterday, so today I had most of the day free and chose to go on a long time organized by Sebastian --- because I like hiking, but also lots of exercise outside should help me adjust to the time zone. We took a fairly new trail, the Skywalk South trail: starting in the Alpine Meadows settlement at the Rick's Roost trailhead at the end of Alpine Way, walking up to connect with the Flank trail, turning up 19 Mile Creek to wind up through forest to Iceberg lake above the treeline, then south up and over a ridge on the Skywalk South route, connecting with the Rainbow Ridge Loop route, then down through Switchback 27 to finally reach Alta Lake Rd. This took us a bit over 8 hours including stops. We generally hiked quite fast, but some of the terrain was tough, especially the climb up to and over the ridge heading south from Iceberg Lake, which was more of a rock-climb than a hike in places! We had to get through snow in several places. We had a group of eight, four of us who did the long version and four who did a slightly shorter version by returning from Iceberg Lake the way we came. Though I'm tired, I'm really glad we did this hike the way we did it; the weather was perfect, the scenery was stunning, and we had a good workout. 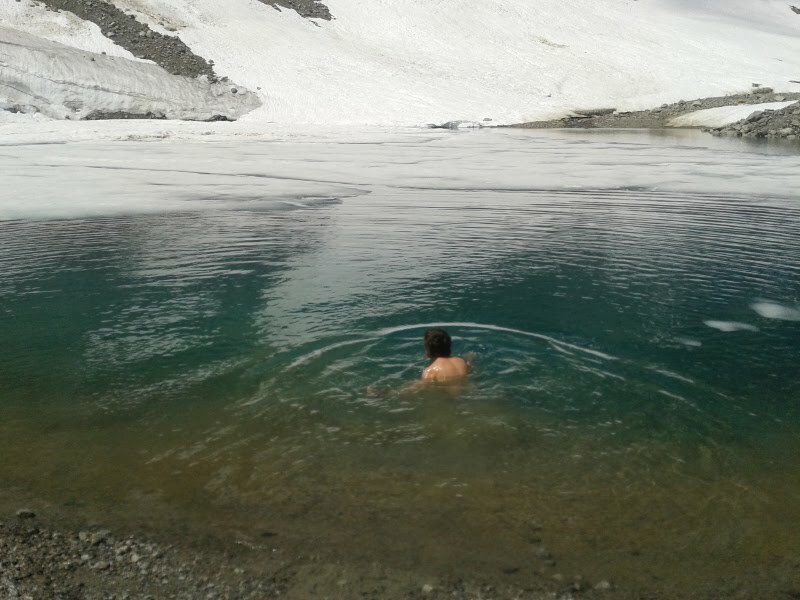 I even went for a dip in Iceberg Lake, which was a little bit crazy and well worth it!